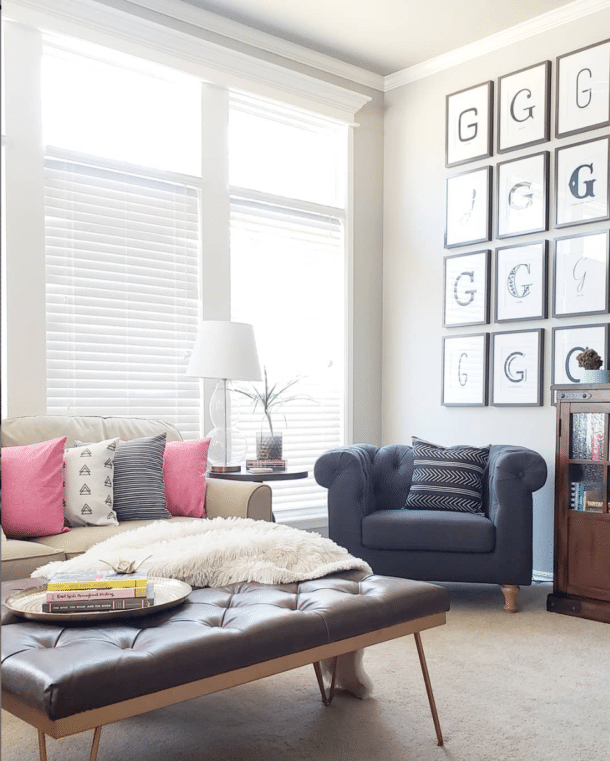 Have you ever struggled to incorporate fun seasonal touches into your overall decor style? 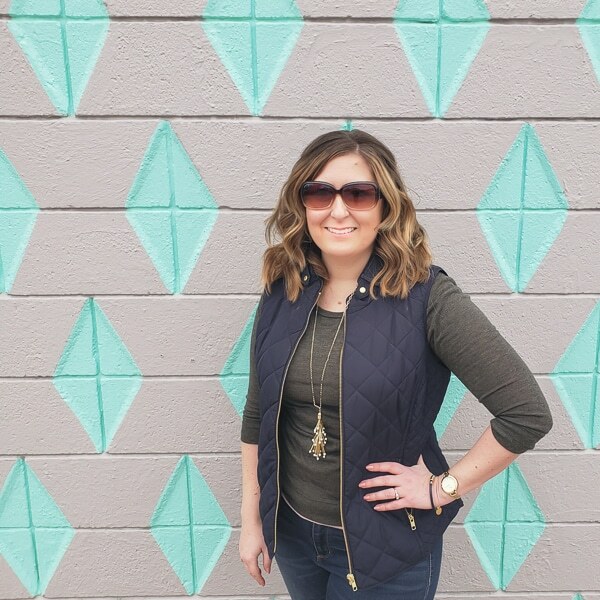 I love freshening up the house for spring, but in the past I’ve made some impulse decisions that left me with items that were cute and fun for spring, but didn’t feel like me after the first week. As I work to give the house a cohesive look, it’s become even more important that all the little purchases fit. Otherwise the entire home decor budget will get quickly gobbled up by each season, with no real progress toward the bigger goal. SOOOO…how do you have the cute seasonal decor AND make it feel cohesive to your house? Can you really have it all? I wasn’t sure myself, but now I know the answer is a big YES! I’ve shopped at Pier 1 for years (really more like a decade, but that makes me feel old). Anyways, when they gave me the opportunity to work with them on a spring tablescape to promote their awesome Spring Dining Sale, I jumped! 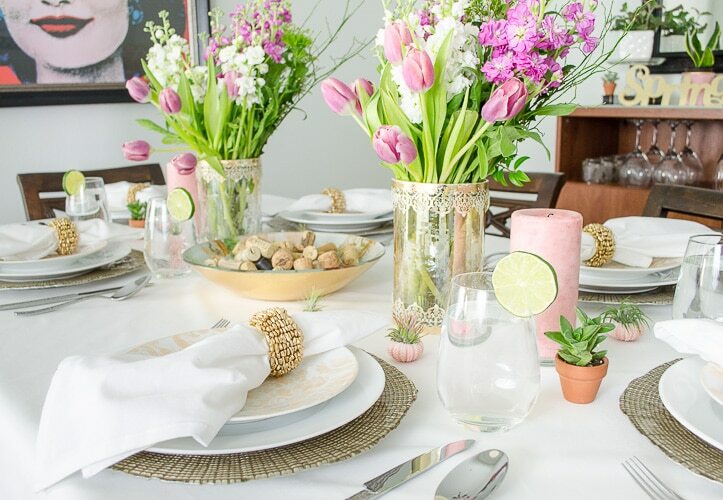 Our dining room is actually one of the spaces that I REALLY want to update, but since that isn’t happening at least until the fall ORC, having a gorgeous spring tablescape lets me look past what I don’t like and focus on the pretty. Did you catch that bonus non-spring related tip? If you have a room you hate, don’t ignore it. Add a few of your favorite things as you save up for a bigger update! 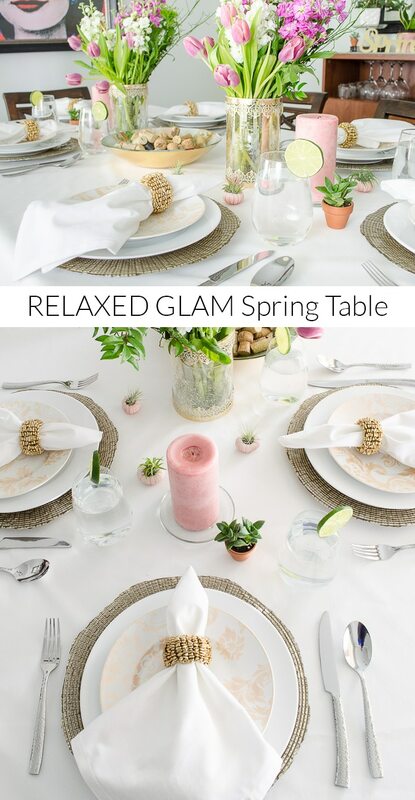 Before I show you my spring table, I want to show you some of the other looks I put together in the store while I was on my quest for our perfect tablescape. I wish I had given my husband a clicker at the store to count how many variations I tried out, I wouldn’t be suprised if I went through 40 different looks. And some of them I really loved. But then I made myself STOP and think about the tablescape in relation to the rest of the house and my design style in general. This combo was ALMOST a winner. 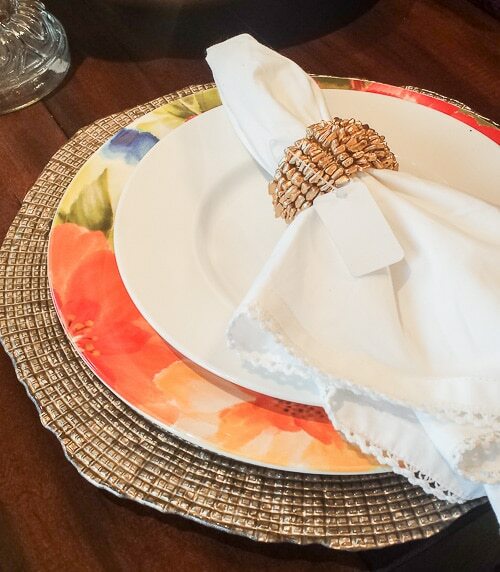 The beaded placemat is even more gorgeous in person. The more I looked at this place setting, the more I thought it would be a better fit in a friend’s house instead of mine. Our dining room always feels a bit dark, and not in a good way, so the darker charger and napkin weren’t the right picks for us. Ten or twelve options later, I was getting closer. The floral plate was SO FUN and the white napkin brightened everything up. I loved the gold charger and napkin ring (no surprise there). I had this idea in my mind of “relaxed glam” and the rough edges of the charger gave it the more relaxed feel I was looking for. But, I still had that nagging feeling again that the combo was perfect for someone else’s house. The biggest problem with both of the prior looks was that they didn’t work with the bowl I was absolutely obsessing over. From the moment I spotted the Elegant Blooms Glass Serving Bowl on the Pier 1 website, I NEEDED it in my life. It’s perfection in a bowl. From the modern graphic flowers to the gold bottom, I loved everything about it. Once I decided that I wasn’t going to be happy unless the tablescape was centered around this bowl, things got much easier. 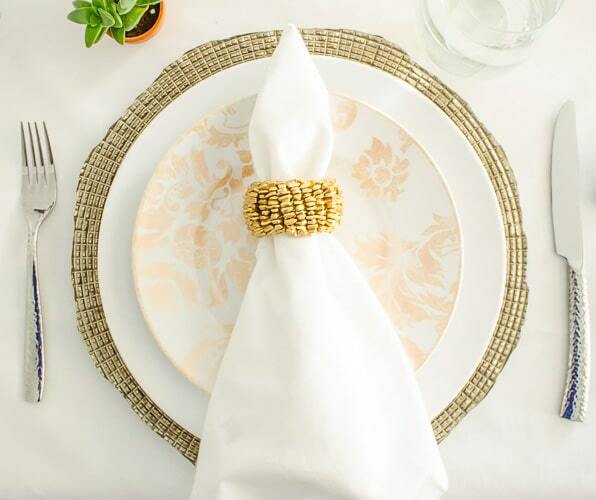 Here’s the close up of the place setting I landed on. It’s a little glam, a little relaxed, and a lot perfect! 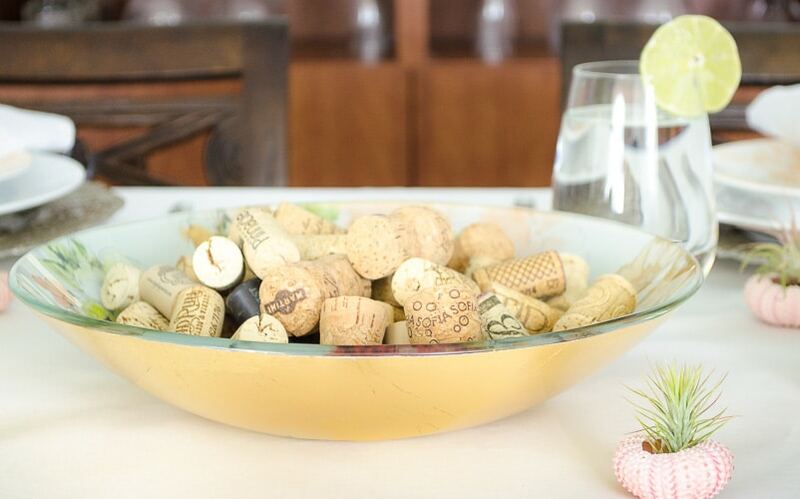 My dream bowl works perfect to hold wine corks in the center of the table. 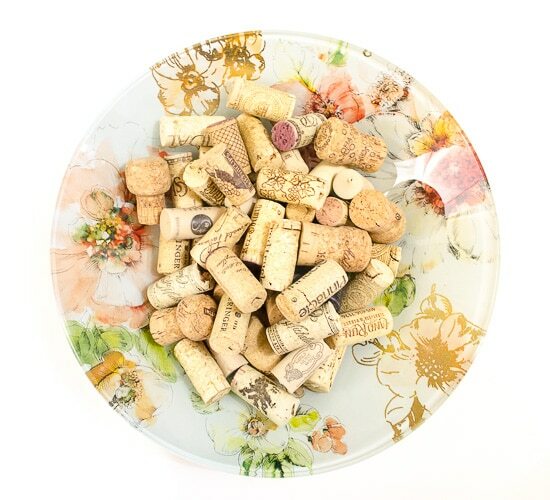 I added just enough corks to be good filler, but not cover up the design of the bowl. The pinks and greens inspired the rest of the centerpiece decor, including some adorable itty bitty air plants in pink sea urchin shells. I knew I needed something with a bit of height on the table and might have pranced gleefully through Pier 1 when I spotted some crackled glass hurricane candle holders with a gold metal lace trim. They were a great compliment to the floral bowl when combined with pink pillar candles. As you can see, I did a strategy change and ended up using the hurricanes as vases instead. They are NOT made to be vases, so don’t hold water on their own, but I just put a clear water glass inside for the water and stems. Ah, it feels like spring AND it feels like me! To finish out the dining room, I added some more plants and a wine station. Here’s one more look at the table. It’s my favorite view! 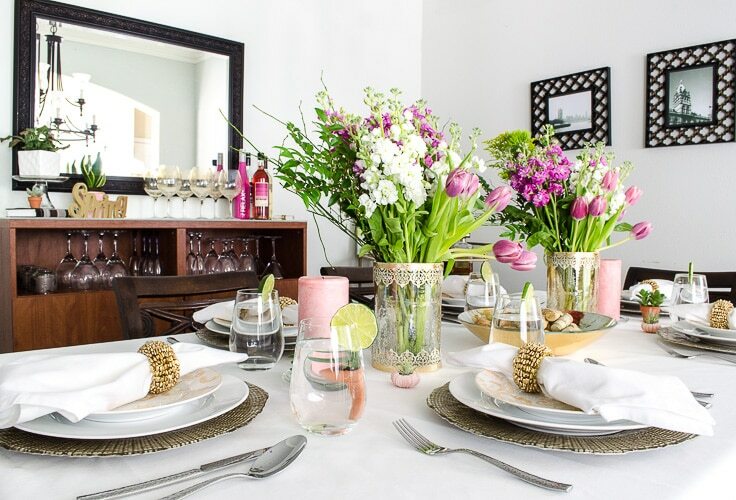 It’s so great to walk past the dining room and see my spring table! Plus, those Pink Champagne candles smell so fresh and clean. Most of all I LOVE seeing that gorgeous bowl. I see it being the centerpiece of our spring table for years to come! 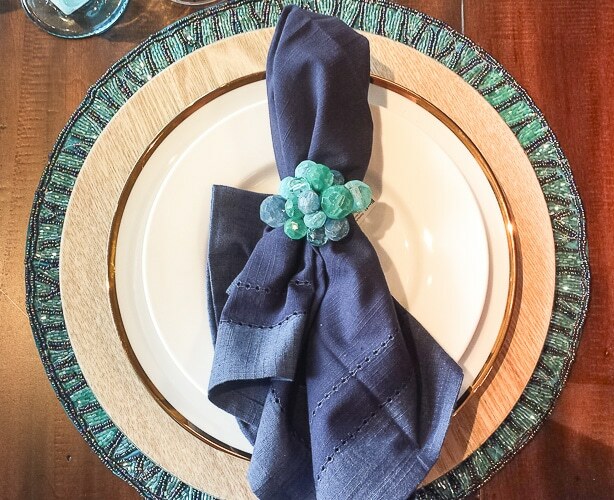 If you love it too, don’t forget to check out the rest of the Spring Dining Sale at Pier 1. 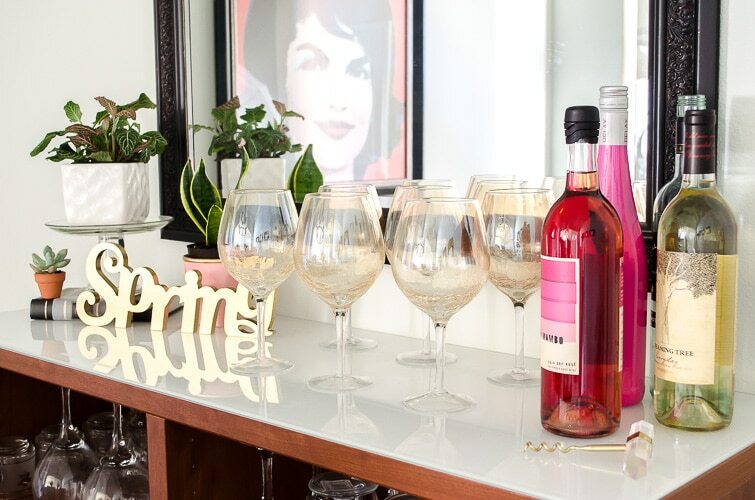 If your style is more whimsical, they have some really fun painted glassware on sale! And if you already have a house full of Pier 1 items, make sure you use #Pier1Love for a chance to be featured on their FanReel. Which of my spring looks would work in your house – the rich blues, the bright floral, or the relaxed glam look? Love what you finally decided on. The bowl is gorgeous! Thank you, I can’t decide if I like the gold bottom or the pretty inside the best! No surprise, my favorite plate is the Jaclyn! Perfect! All 3 combos are lovely, but I think I agree with your final choice. Thanks for sharing! This is gorgeous!!!!!!! I love Pier 1 !!!!! Thank you! And me too. So much good stuff in one store! Oh my goodness, this is just absolutely stunning, Melissa! 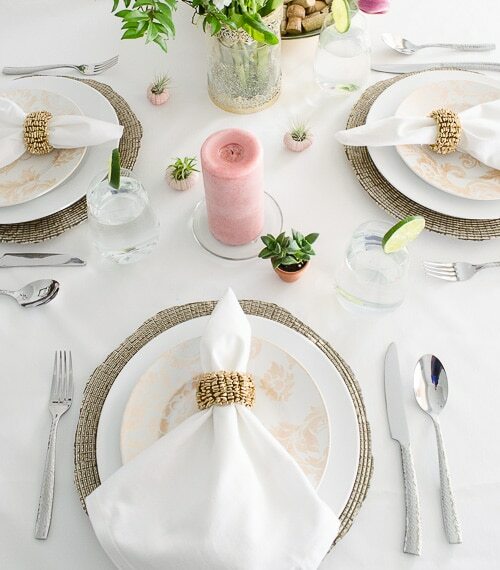 I love the soft pinks in that bowl and the way you used it as inspiration for the whole tablescape! Just beautiful – pinning! So pretty! I love the tablescape. Pinned! Love all the spring colors. And those tiny sea urchin succulent planters are too cute! So pretty! This is gorgeous! Those tiny sea urchin succulent planters are too cute! Thanks for sharing!